Take some jazz, add some funk, blend well with some didgeridoo. Rest a while; take a sip followed by blending, very carefully, some transient sounds, chill and electronica. Let it stand. Turn up the volume, take in the percussion, taste the tropical north and fuse with some dreamtime. Don't overdo the trippin' but enjoy the sheer energy. Result? 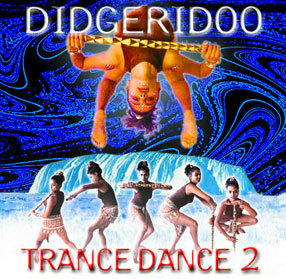 'Didgeridoo Trance Dance 2' perfectly crafted just for you. Following the success of its previous compilation, Music Mosaic presents Didgeridoo Trance Dance 2, with uplifting high-energy music by grand didgeridoo players from around the world that is simply breathtaking! An ancient instrument blend with organic beats and contemporary sounds, will take you through the gates of Trance-Dreamtime, where outer boundaries dissolve into a pulsating inner world Gondwana & Charlie McMahon, Hilight Tribe, Si & Wild Marmelade, Ash Dargan, Andy Graham, Yomano, 1k Science, Ariel Kalma, Papi Moreno, OKA, and other artists play with driving percussion wizards and master remixers to provoke primordial up-tempo rhythms, and mysterious fictional backgrounds of bizarre styles, all sure to trance energies around! The dance-floor spiced with sensuality and raw power, musical stories of multicultural origins are arranged into modern sounds for the new generation of world music. These tracks blend cultural boundaries for an international feel good' album.